5,000 Tons of Rice to Be Shipped to N.Korea by Late Oct.
A ship carrying 5,000 tons of rice the South Korean Red Cross is sending to help North Korean flood victims will leave Gunsan Port on Oct. 25, a Unification Ministry official said Sunday. The ship will stop at the Chinese port of Dandong because it is difficult for large ships to enter North Korea's shallow Sinuiju Port. 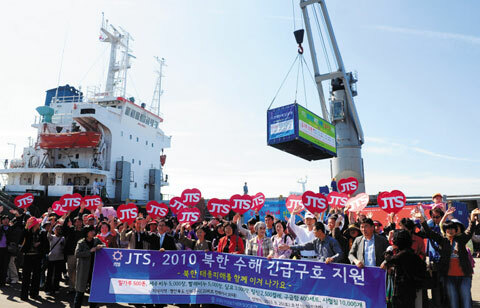 The rice will be unloaded there and transported to Sinuiju overland, he said. The government is appropriating money from the Inter-Korean Cooperation Fund to buy 5,000 tons of rice, the official added. It will submit a report to the National Assembly on Tuesday, and Unification Minister Hyun In-taek, who concurrently chairs the Inter-Korean Economic Cooperation and Promotion Committee, will give final approval for appropriation of about W8 billion (US$1=W1,155). Earlier on Sept. 13, the South Korean Red Cross promised to send 5,000 tons of rice, 10,000 tons of cement, 3 million cases of cup noodles and medicine to flood victims in Sinuiju. The cement will be delivered to the North by ships from Incheon and Donghae ports.